This must be one of the most well-known plants in the world. The fascinating blooms are sold as cut flowers by the million. Strelitzia reginae is indigenous to South Africa where it grows wild in the Eastern Cape. This beautiful and adaptable beauty is perfect for home and commercial interiors. Grows up to 3 feet tall.The uniquely shaped flower of this exotic tropical perennial resembles a bird's head, and due to it's brilliant orange and blue colors and unique form, it resembles not just any bird but a bird-of-paradise! 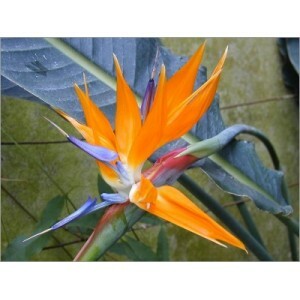 So not surprisely Strelitzia Reginae is know as the Bird-of-Paradise flower. Its flowers are orange or yellow in colour with dark blue tongues emerging from green boat-shaped bracts. They have no scent. They flower mostly in Winter and Spring, but they can bloom all year. Growing them outdoors during the Summer will increase the likelihood of the plant blooming. From seeds, plants given ideal conditions will flower within 3 years. Fantastically handsome flowers aside, this is also a very attractive foliage plant. The paddle-shaped leathery leaves are about 8 inches long and 6 inches wide. Hardiness zones 9-11, (5°C/40°F, -5°C/25°F) in Winter. This plant is tender and is damaged by frost and freezing temperatures but will recover if ground does not freeze. In very cold climates it is better to grow them in pots that could be moved indoors when freezing temperatures are expected.They are however very tolerant plants and will thrive in most soils and can survive with very little water once established. The plants are also wind resistant and grow well in coastal gardens. Regular repotting allows the young plant to develop rapidly. Restricting the root development retards growth. It should be potted in a mixture of sterile potting soil, peat moss, and sand . Excellent drainage is essential. Keep the soil evenly moist. Reduce amount of water to potted house plants in Winter. Feed every two weeks from March through September. They respond well to regular feeding with a slow release fertilizer and compost.Strelitzia reginae is an easy plant to grow in the garden. Plants do well in full sun to semi-shade. 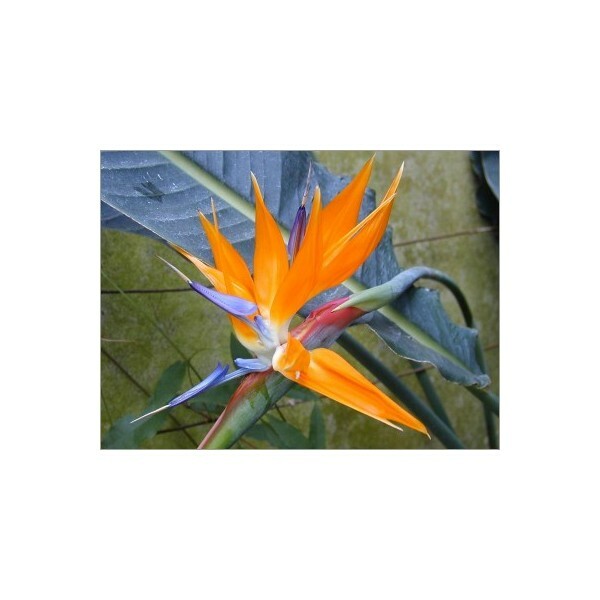 Young Strelitzia plants must be grown in shade, for the leaves tend to burn in direct sunlight. Plant in bright sun for the most flowers, and in shade for the best looking foliage. Germination Smoke Seed Primer is ideal for treating seeds of Strelitzia. You can purchase this in the Smoke Seed Primer category. You can also soak the seeds in hot water for a couple hours.Many wildflower seeds are dormant and need very specific conditions for germination. The smoke seed primer solution contains a combination of natural substances that overcome dormancy and stimulate seed germination. It requires germination in gentle heat. Seeds should be planted in a mixture of sand and potting soil, at a depth of 1 inch. A constant temperature of 25°C is most suitable for germination as low temperatures retard germination. Germination takes 4-8 weeks, maybe more, don't give up.